While rummaging around in the data for yesterday’s big batch of charts, I remembered that there was something else that I churned out at this stage last season. 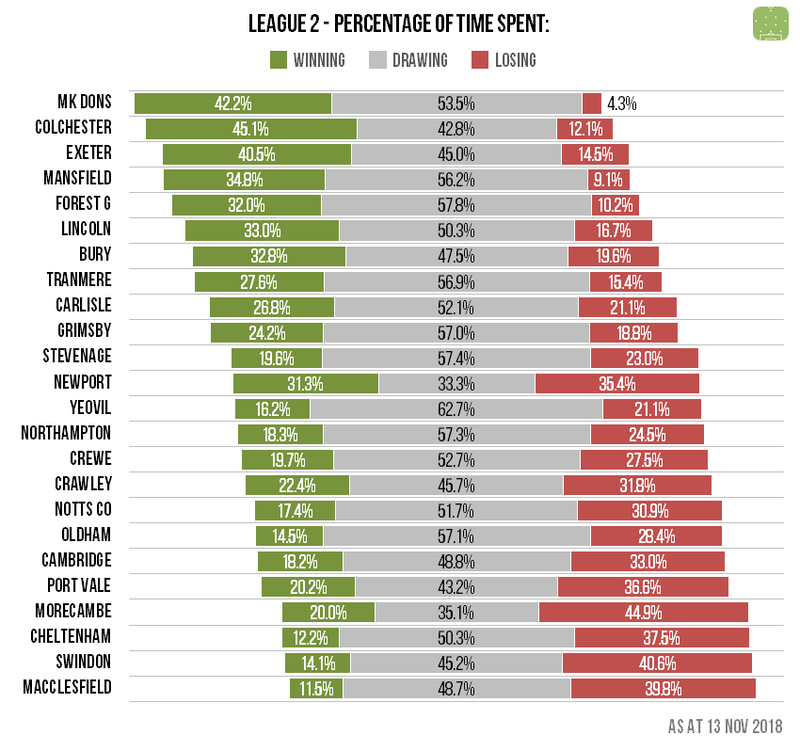 What I’ve done below for each of the top four English divisions is to measure how long each club has spent in each of the three main “game states” – i.e. winning, drawing and losing. I’ve then converted these into percentages and ranked them by the difference between the percentage of time they’ve spent winning versus losing. Manchester City have only been behind for 12 minutes this season, during the second half of their draw at Wolves in gameweek three. Chelsea (44) and Liverpool (66) join them in having trailed for less than a match’s worth of minutes so far, while a leaky Fulham side have already been in a losing position for over 600 minutes. There’s been plenty of drama where Manchester United have been involved, with the scores level less than a third of the time – only their trip to Tottenham (well, Wembley) has seen a goalless first half this term. 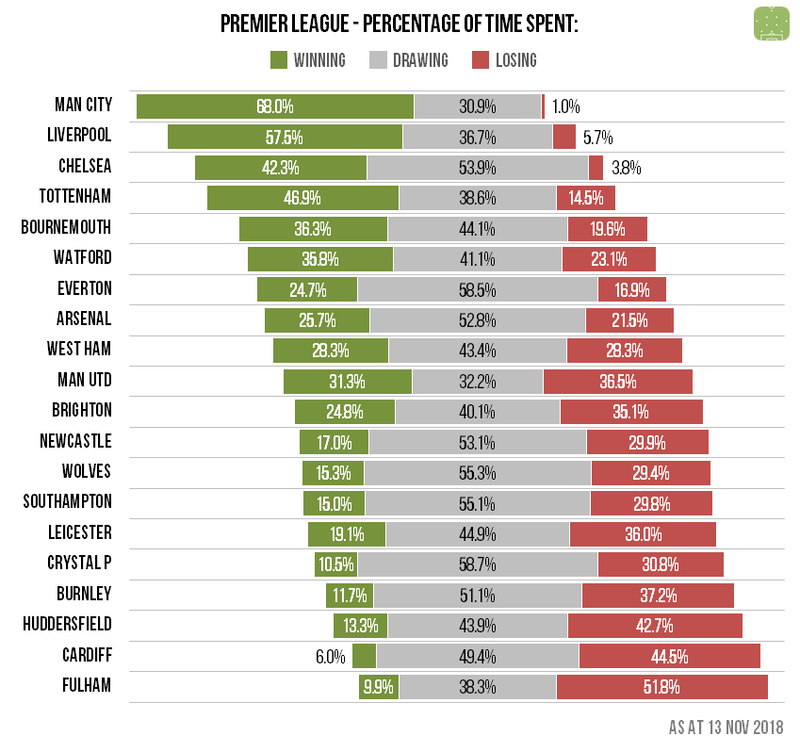 Five teams stand out at the top with similarly small slices of time spent losing but a lot of time drawing … and none of them are the current league leaders. First-placed Norwich have only spent around one minute in every five in a winning position and have actually spent more time losing (381 minutes to 343). It’s been a bleak season for Bolton so far, with almost half of their time on the pitch spent trailing their opponents. 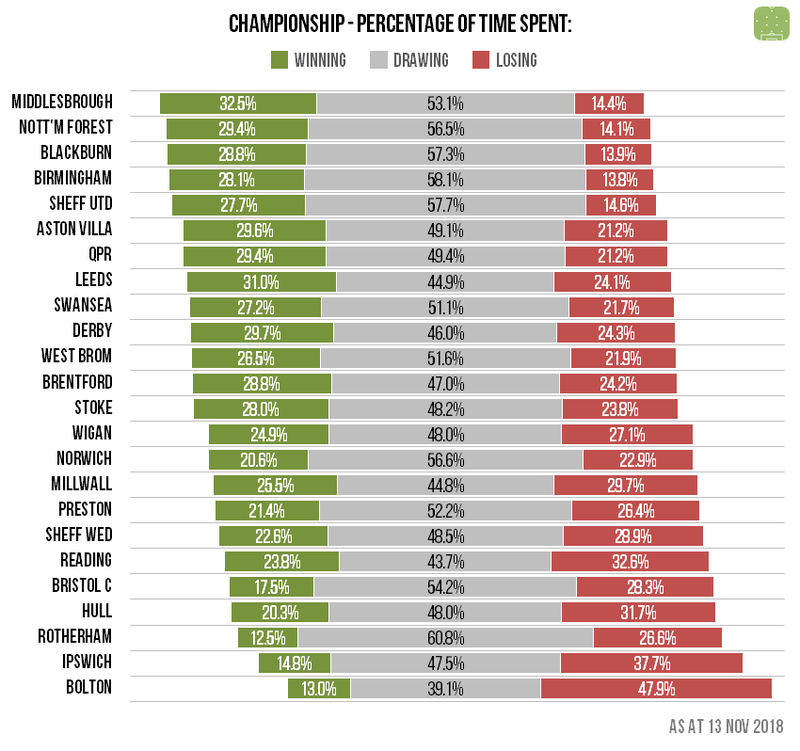 Leaders Portsmouth are the only side to have spent less than 10% of their playing time in a losing position and – along with Charlton and Barnsley – are one of three sides to have spent more than 40% of their minutes with the scoreline in their favour. 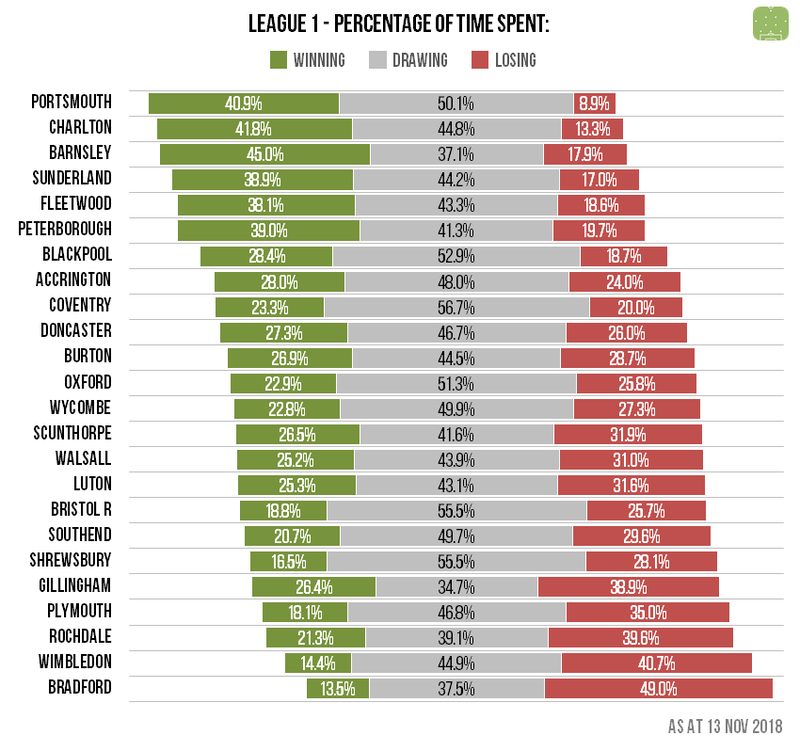 Gillingham matches have seen the game being chased the most often, with the scores being tied only around a third of the time, while Bradford have been trailing for almost half of their total time on the pitch so far. It’s safe to say that Newport’s matches haven’t been boring – their game at Oldham is the only one without a first half goal and as a result they’ve spent far less time drawing than the average side. At the top, MK Dons’ impressive defence has seen them trail for just 71 minutes of the season so far, with struggling Morecambe having done so for over 10 times as long.